Zaanse Schans is the Netherlands in a nutshell: a town of traditional Dutch crafts and architecture, with six windmills, a wooden shoe workshop, a cheese farm and more. 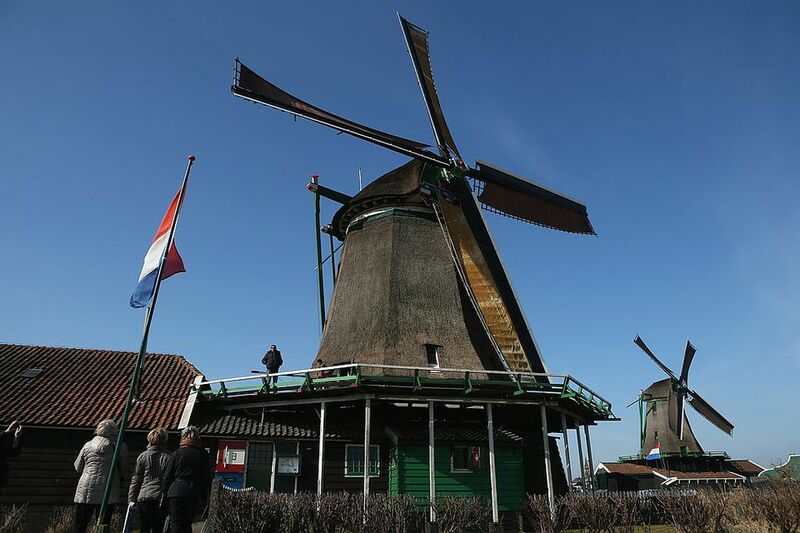 Some think it's an open-air museum, but actually, Zaanse Schans is simply a town full of extraordinarily well-preserved architecture and traditions – one that's capitalized on its authentic atmosphere and added even more typically Dutch phenomena to the mix. Yes, Zaanse Schans is a bit touristic, but that's no reason to avoid it – its immersive approach to Dutch traditions it both a fun and informative day trip (and excellent for kids!). Note that hours vary by attraction and by season (with more limited hours in fall and winter), so check the Zaanse Schans website for the most timely information. By train: From Amsterdam Central Station, take the Alkmaar-bound train to Koog-Zandijk (approximately 20 minutes); Zaanse Schans is ten minutes from the station by foot. See the National Railway (NS) website for schedule and fare information. By bus: Line 91 runs twice hourly from Amsterdam Central Station, and takes approximately 45 minutes to reach Zaanse Schans. See the Connexxion bus company website for exact schedule information. First and foremost, take a tour the inside of one of five functional windmills that are open to the public. Sawmills, oil mills, and a paint mill allow visitors to see how windmills contributed to the manufacture of each product. For real windmill enthusiasts, there's also the monumental Windmill Museum. Explore the traditional crafts of the Netherlands. The Wooden Shoe Workshop demonstrates how the iconic Dutch wooden shoes are crafted, while at the Tinkoepel, pewter smiths cast their wares by hand in a former 18th-century teahouse. For cheese lovers, the cheese farm De Catherinahoeve offers both demonstrations and a taste of the finished product – picture-perfect wheels of Dutch cheese. Shop for artisanal Dutch products. Besides wooden shoes, pewter and cheese, visitors can also find traditional Delfts blauw (Delft blue) ceramics at De Saense Lelie; mustard produced at the local windmill De Huisman; and authentic Dutch antiques at the oldest house in Zaanse Schans, Het Jagershuis. The Bakery Museum "In de Gecroonde Duyvekater" produces the popular duivekater bread, a sweet, oval-shaped white loaf. Retrace the steps of Peter the Great at the Czar Peter House, where the czar himself roomed on his visits to the Netherlands. Or step inside some of the other local monuments, such as the merchant's houses the Honig Breet House and the Weefhuis. Discover the history of Zaanse Schans, an industrial powerhouse in its time (hence all the windmills! ), at the Zaans Museum, or that of two iconic Dutch brands: witness the rise of the Verkade chocolate and biscuit company at the Verkade Pavilion, or tour a reconstruction of the first-ever Albert Heijn shop at the Museum shop Albert Heijn Grocery. The Zaanse Schans Card is an excellent value for visitors: it includes admission to the Zaans Museum & Verkade Pavilion, one windmill of choice, and discounts or special offers for local crafts and restaurants. Zaanse Schans has only two restaurants, in addition to the Zaans Museumcafé, but both consistently satisfy visitors. De Kraai, located in a renovated barn, specializes in Dutch pancakes: sweet or savory pancakes with a diameter of 29cm (nearly a foot!). Classic Dutch pies, such as appeltaart, are on offer for dessert. Perfect for families on a day trip to Zaanse Schans. De Hoop op d'Swarte Walvis is an upscale French restaurant that serves brunch, lunch, and dinner. Its sophisticated dishes are complemented by an extensive wine menu – and fabulously decadent desserts. The Zaans Museumcafé offers top-quality teas and coffees from Dutch brand Simon Lévelt, as well as sandwiches, sweets, and other snacks to refuel Zaanse Schans visitors.